Ten-year-old Abdullah would do anything for his younger sister. In a life of poverty and struggle, with no mother to care for them, Pari is the only person who brings Abdullah happiness. For her, he will trade his only pair of shoes to give her a feather for her treasured collection. When their father sets off with Pari across the desert to Kabul in search of work, Abdullah is determined not to be separated from her. Neither brother nor sister know what this fateful journey will bring them. And the Mountains Echoed is a deeply moving epic of heartache, hope and, above all, the unbreakable bonds of love. The groups opinions were divided. Half really liked the book and the other half didn’t really enjoy it. All agreed it was well written and most people like the characters. 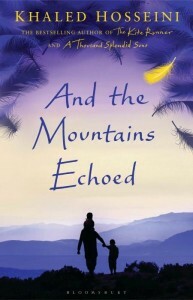 This entry was posted in Book Club Kits, Book Reviews, Fiction, Recommended Reading and tagged and the mountains echoed, Book Group, khaled hosseini by admin. Bookmark the permalink.